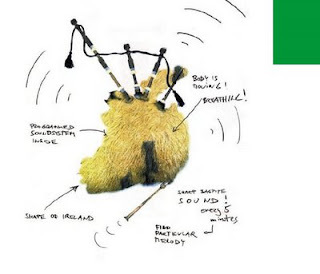 Here's an annotated image of the Ireland element of the Entropa installation in Brussels; other country depictions have been a source of controversy but the Irish one seems faithful to the self-assigned mission of the artists to mock national stereotypes (it appears to be sheepskin with bagpipe attachments). The brochure attributes the Irish piece to John O'Connell, but news accounts claim that the entire installation was done by a 3-man Czech team led by David Černý and not 27 artists as originally claimed. UPDATE: It's not clear from a photo of the actual installation whether the Ireland element is the same as in the brochure (from where the image above comes). Which calls into question whether the Czechs ever verified that what was being hung in Brussels corresponded to what their brochure said. Does Gaza not have cats?